I would like to show you my new game project with name Slovakia Up. 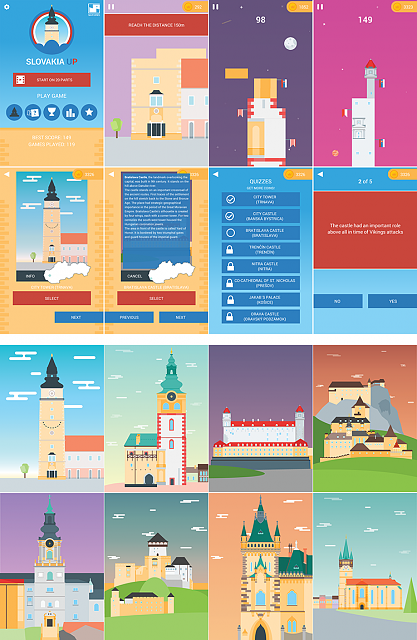 My goal with this game is a little to promote historical buildings from Slovakia, where I live. The game is inspried by a real monuments and places, in beautiful minimalist graphics. It is tower build game, but game contains some interesting informations about buildings. You can play short quizzes about them and get more coins to unlock new places. Hope you like it and let me know what do you think. Thank you! The feedback I have is that you should probably let someone who's good at English review the localization, as at least the English could use some improvement (don't know what other languages you support). Also when you encourage a user to share the game you could use Firebase invites instead of linking directly to the Play Store as that doesn't really help someone who already has the game to share it. Firebase is a very cool suite of services that are very useful. If you don't already you should probably implement analytics into your app as well, that way you can see how people are doing in your game. How far they get, what the retention rate of your app is and other useful statistics. This might help you tweak the difficulty of the game to get more (or retain the users you have). Firebase Analytics is one good analytics provider. You should see what else Firebase provides that might be of use to you as well. Thank you! I am trying implement Firebase Invites .. for now not working .. dunno why, but it will work! I figure it out! Now I will use Firebase Invites in every game. Thank you! Why does Android Auto freeze up without warning.